Photo: James Wins Title, SE Second at GAC Preview. AMARILLO, Texas (Sept. 11, 2018) – Led by newcomer Trevor Norby, Oklahoma Christian bounced back and moved up a spot to fourth on the final day of the season-opening Ryan Palmer Foundation Invitational at Tascosa Country Club. OC, which led the 15-team field after the first round but dropped to fifth after the second round, posted a 283 (1-under-par) on Tuesday to close with a team score of 848. St. Mary’s (Texas) won the team title with an 836 score, followed by Midwestern State (Texas) at 844, St. Edward’s (Texas) at 846 and OC. Norby, a junior from Carlsbad, Calif., shot a 3-under-par 68 on the 6,512-yard course and finished at 209 (4-under) for the tournament, tying him for 10th in the 84-man field. It was his third career top-10 finish, including two while playing for San Diego State. One shot behind was senior Cameron Brown, tied for 12th at 210 after posting a 70 in the final round. Sophomore Andres Brictson’s 71 put him at 214 overall, tied for 22nd. Senior Juan Pallach shot a 74 and tied for 38th at 218, while senior Garrett White posted a 75 and closed at 222, tied for 55th. Emilio Gonzales of St. Mary’s took the individual title, shooting 14-under 199. The Eagles’ next tournament will be the Missouri Southern Fall Invitational, set for Sept. 24-25 at Shangri-La Golf Club in Monkey Island, Okla. The Rogers State women’s golf team began the 2018-19 campaign out in California and finished in third out of 10 teams at the Otter Fall Invitational at Corral De Tierra CC. RSU put together a two-round score of 621 with marks of 307 and 314 each round. Sophomore Jess Whitting paced the navy and red with her seventh top five finish in her short RSU career. The Australian placed fifth at 6-over-par 150 after back-to-back rounds of 75. In the second round today, Whitting posted 14 pars to rank second in the field. Sophomore Jessica Green just missed out on her first career top 10 as she placed 11th overall at 10-over-par 154. After an opening round of 2-over-par 74 yesterday, the sophomore shot 8-over-par 80 in today’s final round. She posted two birdies in the second round today. Freshman Raquel Flores saw big improvement in her second collegiate round as she carded a score of 3-over-par 75 today. With an opening round of 11-over-par 83, the freshman shot 14-over-par 158 to place 18th in her first collegiate tournament. She was second in the field today with two birdies. Raquel’s older sister junior Mariana Flores was only two shots back at 16-over-par 160 for 21st overall. Flores closed with a 12-over-par 84 in the final round on Tuesday after a 6-over-par 76 in the first round yesterday. Junior Sydney Murray posted scores of 82 and 84 for a 36-hole tally of 22-over-par 166 to place 33rd overall. In the final round today, the Wichita, Kan. put together a score of 84. West Texas won the team title at 593 with Academy of Art in second at 610. RSU was third in a field of strong West Regional competition. Academy of Art’s Anahi Servin was the individual medalist at 2-under-par 142 to win by five shots. The Hillcats are back in action at the UCO RCB Classic on Oct. 1-2 at the Golf Club of Edmond in Edmond, Okla. The Southwestern OSU men’s golf team finished tied for eighth place at the Mule Invitational in Warrensburg, Missouri. Kason Cook would finish the tournament as the Bulldogs top scorer shooting a final round of 75 to put him on the leader board tied for 18th. Gregor Weck would shoot the low round of the day for SWOSU as he fired a 72 finishing in a tie for 35th. Heston Brown and Gustavo Tineo would both finish in a tie for 39th as Brown would shoot a 73 on the final day and Tineo would record a final round score of 77. Conner Kauffman would fire his lowest round of the tournament in the final day shooting a 73 and finishing tied for 68th for the tournament. Washburn would take home the team trophy and Craig Stefureak of Drury University would be the individual winner. The Bulldogs will return to the course on September 17-18 in the NSU Men’s Classic in Muskogee, Oklahoma. Blake Murray fired an even-par 70 as Central Oklahoma tied for eighth in the first tournament of the 2018-19 season Tuesday at the Central Missouri Mule Invitational. The Bronchos closed with a 293 at the 6,362-yard, par-70 Mules National Golf Club to finish with a 54-hole total of 865. Washburn won the 18-team event at 845, followed by Central Missouri’s varsity team (846), UCM’s “B” team (852), Henderson State (854) and Lindenwood (857). Murray’s 70 paced Central on the final day, while Joe Lexieux shot 72, Cody Troutman 74, Holden Crago 74 and Yannic Oppenheimer 79. Jacob Lackey closed with a one-over 71 playing as an individual. Murray ended up tied for 18th in the medalist standings at 214 in his first-ever tournament with the Bronchos. He offset two front-nine bogeys with a pair of birdies in making the turn at even-par 35, then did the same on the back nine to finish off his 70. Lemieux had a triple bogey in going out in 39 and got three of those shots back with consecutive birdies on Nos. 11-12-13. He bogeyed No. 17 in shooting a back-nine 33 and tied for 24th with a 215 total. Central returns to action next week, going to Muskogee, Okla. for the NSU Classic. OKLAHOMA CITY, Okla. – Southeastern’s Zach James fired three rounds in the 60’s to win the individual title and pace the Savage Storm to a second-place finish at The GAC Preview at Lake Hefner GC in Oklahoma City, Okla.
James opened with a 65 in the first round before carding his worst round of the week, a 69 in round two. He rectified that by carding a tournament-best 63 in Tuesday’s round to finish with a score of 197, finishing seven shots ahead of second place. As a team, SE carded a first-round tally of 278 and followed it up with a 282 before closing out the event by matching the low round of 272 to finish at 832, three shots behind Southern Arkansas who won the team title. Southeastern finished six shots up on Oklahoma Baptist who was in third, followed by Roger State and Southern Nazarene. Jordan Holifield checked in next for the Storm in a tie for seventh with a 54-hole score of 209, firing a 72 to open on Monday before adding a 69 and a 68 in the final two rounds, respectively. Hayden Foster was not far off that pace in a tie for 12th after carding rounds of 70, 72, and 69 to finish at 211. Bryce Hughes followed up a three-round score of 218 after rounds of 71, 75, and 72 to finish 27th. Ryan Ward was the final team member to finish with a 220 on rounds of 73, 72, and 75 to finish tied for 34th. Oklahoma Baptist put three golfers in the top seven and took third in the Great American Conference Preview Tuesday at the Lake Hefner Golf Course. Hudson Hoover shot a third-round 67 to finish in a tie for fourth at 206. Payton Posada and Davis Farnelltied for seventh at 209. Hoover shot 74 and 65 over the first two rounds Monday. Posada had rounds of 68 and 71 before finishing up at 70 Tuesday while Farnell mastered the third round at 66 after Monday’s 72-71. The Rogers State men’s golf team and sophomore Luke Palmowski both placed fourth. The Hillcats posted a 54-hole score of 847 for fourth out of the eight team field, and Palmowski was 10-under-par for fourth as an individual. 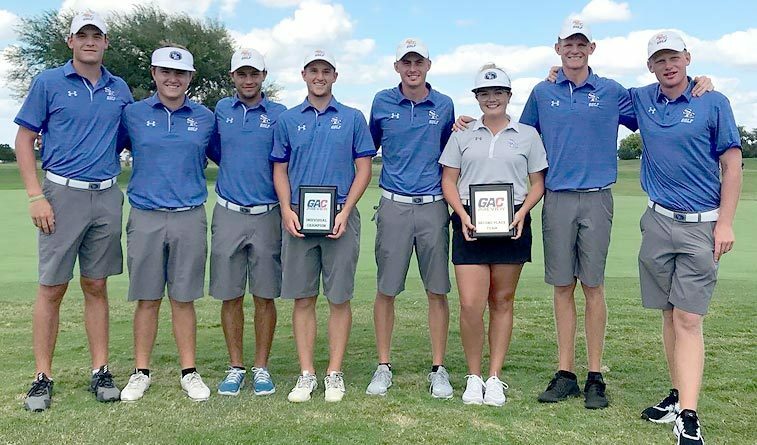 Although the navy and red finished fourth, the score of 847 is the second-best 54-hole total in program history behind the 845 54-hole score shot at the Heartland Conference Championship last season when the Cats won the league title. Palmowski closed today with a 3-under-par score of 69 for the total mark of 10-under-par 206. Appearing in his first collegiate tournament, freshman Edwin Blomander took 14th overall after a 2-under-par 70 for a three-round score of 4-under-par 212. The Swede carded 16 birdies, the second-most in the field. Sophomore Peter Cummins shot the best score of the day for the Hillcats at 4-under-par 68. Gonzalo Chaves ranked 24th overall with his second straight round of 72. Senior Patrick Bart closed with a 3-over-par 75 in Tuesday’s final round to put together a score of 3-over-par 219 in the tournament to place 28th. SPRINGFIELD, Mo. –The Oral Roberts women’s golf team fired a season best 294 on Tuesday to finish in fifth place at the Payne Stewart Memorial at Twin Oaks CC. Memphis won the tournament by 13 shots with a 54-hole score of 860, while ORU finished at 897 (300-303-294). The 294 was the best score of the season for ORU, marking the second time this year in which ORU has broken 300. ORU shot 299 in the final round of The Lady Maxwell. Sarah Bell and Isabella Caamal each shot 73 in the final round. Caamal had a pair of birdies in the final round.